After the dramatic events and the very pleasant company the previous day, it had become time for us to leave Bonham and Texas to drive to southern Louisiana, a drive of approx. 400 miles that could be done in 6½ hours. That is with no stops, and if you take the direct route. But we are not known to always take the most direct path, even if it happens from time to time, but this July 3rd was not one of those times. Now, Bonham is located in northern or rather northeastern Texas, only about 10 miles south of the Oklahoma state line, and as Oklahoma was one of the states we had never visited, we agreed to change that. So instead of driving south from Bonham, we set our bearing north. A small road, Texas State Highway 78, leads from Bonham and directly to the state line. It does not go through any towns, which is a little bit annoying as towns with interesting names like Ivanhoe and Telephone are located nearby. The latter has got its name because the local store was the only place in the area that owned a telephone in the 1880s. So instead of passing through town and villages, we drove through a relatively ordinary landscape that might as well be Danish; relatively flat with farms, cultivated fields and in between small groves of trees. After the 10 miles, we reached the state line, which is here made up by the Red River, which at least I know from various western novels from my youth. But neither me nor Tim had seen this river before. You cross the river on a nice bridge, that we took some pictures of, and we also took pictures of the river itself. We continued around half a mile into Oklahoma to a place where we could turn around, took a couple of pictures here as well and then headed south once more. In total, our visit to Oklahoma lasted just under 10 minutes, but now we can say we've been there! And so I have visited 41 of the contiguous 48 states – if only very brief in this case. Since there is only the same road in this area, and it is without any side roads, we had to return the same way we had arrived until we got back to Bonham. From here we headed east on US Highway 82, passing through the town of Honey Grove, where honey is grown or...? J We continued east to Paris, Texas. They actually have a copy of the Eiffel Tower - and because we’re in Texas, the tower is dressed in a red cowboy hat, but we didn’t visit, just passed town. From Paris we turned south on US Highway 271. As we headed south, our GPS insisted on several occasions that we should turn east, which we did not quite understand and did not agree with at all. It started when we passed the small town of Mt. Pleasant, where we failed to turn left when the “lady in the box” suggested it, but continued straight ahead. Initially, she wanted us to make a U-turn and later on insisted that we should take small side roads that would obviously lead us back to the road we had "missed" on purpose. Eventually, we got so annoyed that we "killed" the lady and then just continued as we pleased. When we got back to Denmark I've investigated the matter further, and now I recognize that the GPS wanted to get us on to Interstate Highway 30, which is the route both Google Earth and other mapping software suggest – if you are searching for directions from Bonham, Texas to Bossier City, Louisiana, but we were sure that it would lead us astray. We therefore proceeded to the small town of Gladewater, where we changed to US 80 east to Longview. Here we met with I-20 and took that east. Well on the interstate we revived the lady and set her to show us way to a certain restaurant in Bossier City. Not any old restaurant but a place called Strawn's Eat Shop ALSO (yes, it's in capital letters as the picture shows). 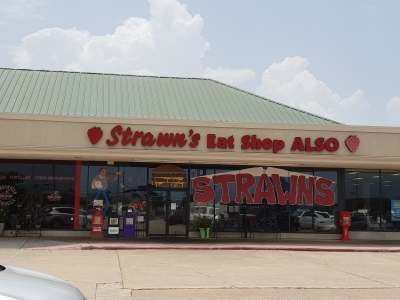 This name indicates that there is at least one other Strawn's Eat Shop, and there is. Actually there are two more: Strawn’s Eat Shop and Strawn’s Eat Shop TOO! When we were heading for this particular restaurant, it was of course for a reason. Normally, we have lunch only on very rare occasions on our trips, and when we actually do, it's typically in restaurants at a freeway exit, most likely one of the many chain restaurants that are abundant at the exits. As mentioned above Strawn's is a chain as well, but a rather short chain! But why were we going to have lunch at this specific restaurant? Well that was because another one of Tim's acquaintances, Rissa, works at this place, and he would like to say "Hello" and the two of them had agreed that we should have lunch there. We found the restaurant without problems and went inside. Rissa had not started her shift though and was not yet present, so we just ordered some lunch, and at the same time as it was served, she arrived. The food on the premises was plain, every day food but very good and the prices were very reasonable. I forgot what Tim had, but I ordered a bacon burger for five dollars and a soda ($3.50). While we ate we chatted with Rissa although she obviously had to take care of her customers in between. She insisted that we had a piece of pie for dessert. The place was obviously famous for their pies, and we ended up persuading ourselves to share a piece of strawberry pie without a whipped cream, as Tim suffers from lactose intolerance. In the end we had to say goodbye as we still had more than 200 miles to go – and Rissa paid for our lunch! And thank you again for that, should you happen to read this. We headed back to the interstate and continued south on Interstate Highway 49 to Lafayette, from where we just continued in the same direction but now on US Route 90 to our final destination in New Iberia, where we had booked a room from home. In fact, this vacation is probably the one where we have pre-ordered the most rooms (except the very first in 2000, where every single hotel was booked in advance as we were 11 people travelling together). After a while the weather began to change from sun with a few clouds to very cloudy, and gradually it turned not just to rain but to a severe thunderstorm. Along the way we made a couple of stops, partly to get gasoline on the car, and partly to get a cup of coffee. One of these stops took place while the weather was worst, so just getting from the car into the store made you completely soaked. The temperature had fallen slightly again compared to the day before, and was between 85 and 95 degrees all day, so it was definitely not cold. While at one of our stops, Tim received a text message from Rissa telling that lightning had struck somewhere in Bossier City and had three transformer stations out of order so that the entire city was out of power. They had therefore had to close the restaurant and send everybody home, customers as well as staff. It kept raining the rest of the way to New Iberia, sometimes so much that we had to slow down considerably down on the freeway, sometimes just a quiet but steady trickle. We got to the hotel around 7.15 pm after having left Bonham a little before 8 in the morning, so it was a long day - but of course interrupted by about 1½ hours of lunch time. We ate dinner at a Ruby Tuesday, which was right next to the hotel and the two businesses actually shared the parking lot. This meant that we could walk back and forth - and at that time it had almost stopped raining. So ws used the occasion to actually have a beer with our food. Around nine we were back at the hotel and could rest before the next day's exertions that would take us to the swamp - and to Avery Island. As we had not taken shortest route, the drive of the day ended up at 458 miles or 737 km. Today was the 4th of July, but from previous years’ experience, we did not expect anything to happen in town and that proved to be case, so instead we had booked a swamp tour at Lake Martin, as we did also on the 4th of July in 2014. The tour would leave at 9 am, so we got up early and left the hotel early enough to be at the small “harbor” in Breaux Bridge half an hour before departure, as recommended. The first time we were there, we paid in cash after the tour, but this time we had paid in advance, so we just had to register when we arrived. While we waited for departure, we chatted with some of the other participants, among these a lady from Germany, who had lived in the United States for more than 40 years, but still could recognize our language as Danish. Not many Americans can do that. We are often mistaken for being German or Dutch. The boats are very silent so you can get close to wildlife without disturbing and relatively small with room for only about 14-15 passengers sitting on seats that are placed on either side of the boat, one seat per row, both to keep the balance but also to give all passengers an uninterrupted view. The boats can sail almost everywhere in the shallow water of the swamp. In some places the depth is no more than 15 to 20 inches, and the deepest place is around 40”. As the guide explained: “Should you fall into the water, don’t panic, just stand up”. Only in the middle of the lake itself is it deeper, up to 8 or 9 feet. On our first visit here, the owner of the small tour company himself was the boatman and guide; this time it was his son-in-law. The owner is a botanist and zoologist, and our guide like his father-in-law, was Cajun born and raised in the swamps, and his father-in-law had taught him well when it comes to nature. 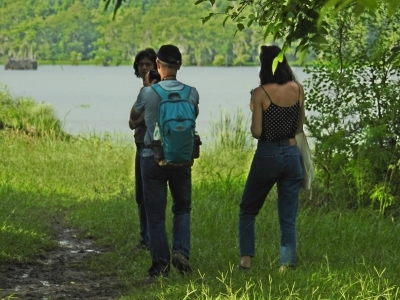 This meant that the trip was as interesting as the first time, and Tim and I agree that, although we have tried swamp tours in many places, both in Louisiana and Florida, the swamp tours at Lake Martin is by far the best we have tried so far. Unfortunately, the weather didn’t behave as we could have wanted. It was cloudy when we left the small “harbor”, and it stayed that way, except when it was raining! In fact we had a few heavy showers along the way, and we heard thunder in the distance, but fortunately, the lightning and thunder kept their distance, otherwise the trip would have been canceled. Being in a small metal boat on open water in a thunderstorm is not optimal. When it started to rain, our boatman Jarred offered us some small umbrellas, but neither Tim nor I did use them, as we knew from previous experiences that our clothes would quickly get dry again as soon as the rain stopped. Along the way we saw lots of animals, mostly birds; herons, egrets cormorants, anhingas, red-winged blackbirds and many others, and unlike last time we saw two different ospreys sitting by their nests in tall trees. There were, however, not as many alligators as on our previous visit, and the ones we did see were quite small. Jarred explained that it was because the weather had been very hot for such a long time that the water was heated up to a temperature where the alligators did not have to get up to warm in the sun. They could keep up their body temperature even under water. I think the biggest one we saw on this trip was about 5 feet, not much more. Just before we reached the harbor, a very heavy shower broke loose, which meant that one of the cars that was parked a little outside the parking lot was helplessly caught in mud, so Jarred, me and another guy helped the driver push it “on dry land” while his wife was at the wheel, and the family thanked us all for helping them out. Before we left the place, we had had a conversation with the German-American lady and her completely American husband, about how we would spend the rest of the day. We had told them that we would drive to Avery Island and visit the Tabasco Country Store. The lady thought that the store would be closed because it was July 4th, but Tim and I knew better, because we had visited the store on Independence Day 4 years earlier! We headed back to New Iberia, where the road to Avery Island begins. Unfortunately, it turned out that the lady was right! The store as well as the museum, restaurant and factory was closed due to the holidays. So much for not taking advice from strangers! But the small park on the “island”, Jungle Gardens, was open so we went there instead. At our last visit we last saw some big alligators in the park, but this time we saw only two and they were less than 4 feet in length and swam around in an almost dried out water hole. The most interesting part of the park in my opinion is Bird City, where, as the name suggests, a lot of birds are gathered, not least different kinds of egrets and herons. This year, most were Great Egrets. The Americans divide herons into two kinds, egrets, that are always white, and herons who are all those species that are not white. However, they can have many different colors and we did see some great blue and a single little blue and also one green heron. On our first visit to the park, there had also been a lot of a species called roseate spoonbills. However, there were none of those this year, but a couple who was also there told us that the spoonbills had moved to another “island” in the marsh, Jefferson Island. When I put "island" in quotation marks, it's because it's not really islands, but just some hills that pop up above the marsh and are surrounded by canals. When we got back to the car we found that Jefferson Island was only about 20 miles further west, and we decided to take the advice and drive there as well. We found the place and saw the birds, but they had settled on a small island in one of the canals, and even with my 600 mm tele lens they were simply too far away to get any really good shots. So much for taking advice from stranger! After this waste off time we headed back to the hotel and relaxed for a few hours before having dinner. This time we tried a chain restaurant called Chili's. These restaurants have a concept that is very similar to that of Applebee's, where we regularly eat, except of course that the food is Mexican. It was the first time we tried one of these restaurants, but it turned out to be quite good. After our meal, we headed back to the hotel so get some rest before the next day's stage, which was planned to be the longest on this vacation, and it would be even longer. Here on July 4th we drove only 87 miles so in the two days since we left Texas we had driven a total of 545 miles.